1275 1275 0% off in Rs. Plastic technology is one of the fields where people can show their ability and performance both theoretically and practically. The Indian plastic and polymer industry has taken great strides. In the last few decades, the industry has grown to the status of a leading sector in the country with a sizable base. The material is gaining notable importance in different spheres of activity and the per capita consumption is increasing at a fast pace. Continuous advancements and developments in polymer technology, processing machineries, expertise and cost effective manufacturing is fast replacing the typical materials in different segments with plastics. Some examples of the specialty plastics are polytetra fluoroethylene (PTFE) , thermoplastic polyurethanes (TPU), polysulphones (PSO), polyester sulphone (PES), polyarylates, polyamide imide (PAI), etc. Polyurethane is polymer composed of a chain of organic units joined by carbamate (urethane) links. Polyurethane polymers are formed by combining two bi or higher functional monomers. Urethane foam is an artificial material with several different uses. The manufacturing process can produce foams of varying densities and flexibilities. This means it can serve functions as diverse as bedding, packaging and footwear. It is important to note that urethane foam is most commonly used to refer to a material made from polyurethane. Furniture, bedding, automotive interiors, energy management, footwear and insulation utilize flexible foam technology due to its wide range of density, cushioning ability and versatility of use. Appliance (refrigeration, water heaters), construction panels, roofing boardstock, and spray applied insulation utilize rigid polyurethane foam due its superior insulating and mechanical properties to reduce energy consumption and enhance structural integrity of the finished product. The versatility of the technology and processability makes rigid polyurethane foam uniquely suited for other applications, like architectural molding, energy absorbing materials in automobiles, entry doors, and even picnic coolers. Polymer Energy system is an award winning, innovative, proprietary process to convert waste plastics into renewable energy. Polymers are the most rapidly growing sector of the materials industry. Some fundamentals of the book are properties and applications of speciality plastics, thermoplastic polyurethanes, formation of urethane foams, flexible foams, variables in the preparation of prepolymers, procedures for the preparation of prepolymers, catalyzed prepolymer preparation, application of flexible foams, applications of rigid foams, one-stage injection stretch blow moulding, pet material and applications, injection and co-injection preform technologies, pet film and sheet, plastics as safe & hygienic medium for packaging food & food products. The book covers processes and other required information for the manufacturing of different specialty plastics, Foams, PET and Pre form PET etc. This is very useful book for new entrepreneurs, technocrats, existing units, institutional libraries etc. Over the past four decades, biaxially oriented PET film has become one of the most important materials in the global packaging market. This chapter presents a review of the technology, which produces this packaging medium. Its aim is to illustrate the wealth of science and technology which contributes to the manufacture and success of this product, and to indicate the potential that remains in polyester film for continued growth as a modern packaging material. Biaxially drawn polyester film was developed by ICI in Europe and DuPont in the US in the 1950s, with Dupont introducing the first commercial film line in the late 1950s. There was a slow increase in the number of film manufacture throughout the 1960s and 1970s and production mushroomed in the 1980s and 1990s. From the late 1990s onwards, there has been a major consolidation in the industry, with Du Pont buying the ICI Films business and then forming a joint venture with Teijin, Toray acquiring Rhone Poulenc and Chiel and joint- venturing with Saehan, and Mitsubishi Acquiring Hoechst. The global capacity of PET film in 1999 was 1,250,000 tonnes. There are now about 30 producers of PET film worldwide. Dupont Teijin FilmsTM. and Toray Saehan Inc. are the major producers, with declared capacities of about 250,000 tonnes and 220,000 tonnes, respectively. Mitsubishi and SKC form the 'second tier' with approximately half the capacity of the top two. The next in order is Kolon (Korea), with about half the capacity of Mitsubishi and SKC. PET film's unusual balance of physical, chemical, thermal and electrical properties has made it appropriate for a wide range of specific engineering functions- from acting as a carrier to performing as an electrical, physical or thermal barrier, or as a manufacturing aid. Due to its unique balance of properties, PET film has found acceptance in many market, including industries producing computer tapes and video tapes, motors, capacitors, flexible, circuitry, graphic arts material, release products, cards, labels and packaging. About 350,000 tonnes of all polyester film produced globally is destined for use in packaging. It is therefore understandable that the processes by which film is produced from PET and the practices which modify extend its performance are the subject of regular interest and review. By describing the current standards in polyester film manufacture and the acknowledged underlying science and technology, this chapter is intended to provide such are review. In the following section, each stage is described and discussed in more detail. Polymer can be extruder fed to the drawing process or it can bedirectly fed from a continuous polymeriser (CP). In both cases, the virgin tends to have a number averaged molecular weight (Mn) of about 20,000, although higher and lower molecular weights are filmed. In the extruder film lines, the polymer handling involves blending and drying. As discussed in Section 6, blending is a consequence of the film process never being 100% material efficient and virgin polymer is therefore blended with polymer reclaimed from the film process. Having already been processed,the reclaim is usually of lower molecular weight than the virgin polymer; therefore, the ratio of reclaim to virgin chip must be carefully controlled to ensure that the resulting mixture will yield a feedstock of adequate molecular weight to be filmed. Drying is essential in closed (single- screw) extrusion systems, as the PET is susceptible to hydrolysis resulting in a reduction in molecular weight. Less commonly, processes have evolved based on vented (twin-screw) extruders, where moisture is removed just after melting. In the drying stage, polymer is crystallised first to avoid the chip sintering during drying and is then dried for several hours at 160-180Â°C to reduce the moisture level to 10-30 parts per million (ppm). 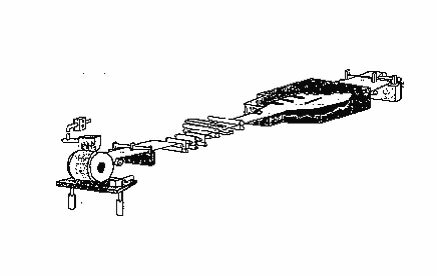 Close- coupled CP film lines do not have this stage and melt is pumped directly through filtration to the die. Fig.1 : A typical film manufacturing process. The blended and dried polymer is then melt extruded through a slot die. There is usually melt filtration before the die to remove degraded polymer, gels, catalyst residues and pipe deposits. The extrusion system is typically designed to deliver stable output up to about 2.6 tonnes/h over a wide range of operating conditions and throughputs. In exceptional circumstances, higher outputs are possible, up to about 3.5 tonnes/h on thick film lines using complex tandem or parallel, extrusion system. The requirements for film extruders differ from those for most other products in that it is necessary to maintain a very steady output, avoiding fluctuations that could cause thickness variation in the machine direction of the film. This high degree of output stability is often achieved by inclusion of a melt pump after the extruder. The system must also be designed to keep the polymer melt temperature low and to avoid 'hold ups'. So that the polymer does not degrade causing defects during interruptions to the film process. The aim of the casting is to produce a contiuous uniformly thick film of non-crystalline polymer with no surface blemishes and this is achieved by drawing down the melt curtain onto a cating drum. The temperature of the polymer melt from the extrusion system will normally be 280-310Â°C, and to minimise crystallisation, which would increase film haze and brittleness and possibly cause a film breakage later in the filming process, the molten film has to be cooled as quickly as possible below its glass transition temperature (Tg). This is achieved by colling the casting drum using recirculated water, which passes through ahead exchanger to control its temperature between typically 10Â°C and 15Â° C. Thin film can be satisfactorily cooled using a single drum normally 600-900 mm is diameter, but for thicker films, where the insulating properties of the film prevent cooling through to the air (non-drum) contacting side of the melt, a second drum is used to provide additional cooling. As the casting drum rotates, air is drawn into the gap between the film of melt and the drum, affecting the contact between the two surface and the effectiveness of the cooling. This is avoided by electrostatically charging the film surface using a pinning wire or blade electrode stretched across the drum just below the die face. This creates an electrostatic field around the wire or blade, which induces a charge on the melt curtain surface. The charged film is attracted onto the earthed casting drum evenly across its full width. The charge generated on the film surface depends on the film speed, and the position and shape of the electrode. A blade electrode gives a more focused area of high-density charge than does a wire electrode, and this is important for casting at high speeds. The conductivitly of the polymer can also be a factor and metal salts, such as magnesium, can be added to improve the conductivity. As mentioned above significant levels of crystallinity in cast film will contribute to higher levels of stress during subsequent drawing stages, which in turn create issues around profile and even web fracture. It is therefore not surprising that enormous resources have been spent to study the phenemenon of crystallisation of PET in order to understand the key factors likely to control the rate of crystallisation in the casting stage. Crystallisation compromise two principal processes: an initial events which is known traditionally as nucleation and is referred to as such in the present text, and a subsequent process of growth. The rates of both processes are sensitive to temperature but the dependency of each is different. Nucleation occurs more a maximum rate at higher temperature, In an effort to cast from the melt a PET film which is truly amorphous, the heat transfer or quenching must be sufficiently rapid to prevent both processes. 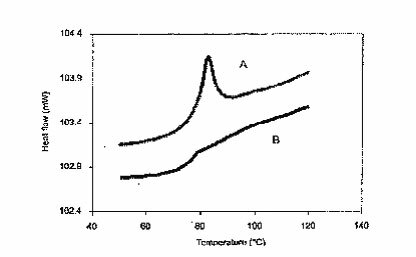 Fig.2 shows the dependence of the rate of isothermal crystallisation of PET on temperature. The rate is the product of the rates of nucleation and of growth, passes through a maximum midway between glass transition temperatureand melting point (TM). 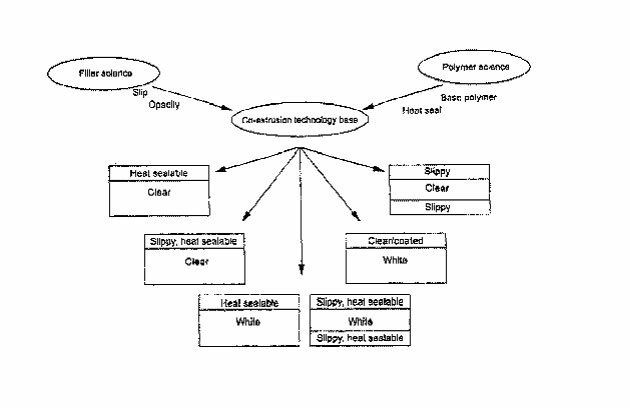 Here the diagram suggests that in order to cast PET film which is amorphous, heat must be removed from the melt on a timescale that is far shorter than that of early crystallisation. This is easily achieved for thin, clear film but more difficult for thicker cast film. 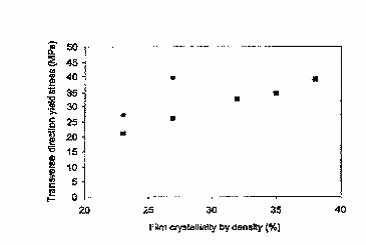 However, Fig.2 also highlights the effects of an inorganic filler dispersed in PET on its rate of crystallisation. The enormous increase in overall rate is due entirely to faster nucleation, which is heterogeneous in nature and presents a challenge to the production of wholly amorphous film from this system. In practice, some crystallinity does establish in cast PET film that is either of thicker guage or contains high loading of inorganic additive. Fig. 2 : Crystallisation of PET. Key.. 0.665 intrinsic viscosity (iv);.0..574iv;. 0.578v. 0.1% filler. Since the presence of crystallinity is known to alter the behaviour of cast film in the subsequent draw stage of the process, and in practice increases the risk of film failure, it is important to understand and predict the level that can establish at this early point in the process. This is achieved by combining a simple heat transfer model of the casting stagewith a kinetic model for crystallisation. Example of both are widely reported, and often a simple Avrami expression is sufficiently accurate to describe the phase transformation of the material. 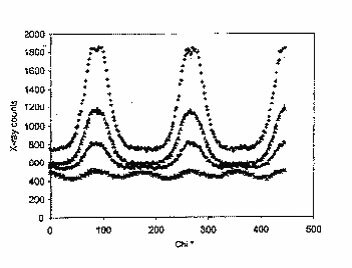 An Avrami model was adopted in one of the earliest published reports of PET crystallisation More sophisticated kinetic models may be preferred to represent the crystallisation of complex system based on PET but containing filler, nucleating agent or other commercial additive. The effort to characterise and model the crystallisation that will occur in a real film under specific casting conditions has proved successful, and most film and equipment manufactures will posses this capability. However, it is worth noting that models based on heat transfer calculation and crystallisation Kinetics measured in the laboratory still present only an ideal account of the process of change that the film undergoes on the casting drum. For example, nuclei can pre-exits in the extruded film either from large, unmelted crystals in the dried chip or as a result of shear in the die. Similarly, particular such as catalyst residues can persist in the polymer and act to varying degrees as heterogeneous nucleants Some of the general they can be a source of deviation from the expected crystallization Kinetics during casting. It is virtually impossible to account quantitatively for the influence of all such parameters on film at the casting stage; however, an awareness of their presence is important and serves to emphasise the value of the underlying science to the management of the material at this stage of the process. Finally, some macroscopic consideration of the casting drum itself must also be made. The surface of the casting drum must be of a very high standard to avoid imprinting any patterning or 'graininess' on to the cast film. The surface must also be hard in order to avoid damage and must be resistant to corrosion so that no pitting occurs. Therefore, a drum that is hard chrome- plated and highly polished is usually favoured. During operation, the casting drum must be free of vibration and must rotate smoothly to minimise any source of variation in thickness in the machine direction of the film. The preheat zone of the forward draw is worth considering separately, since any stage at which the nature of the film can change provides an opportunity to influence and control its properties. In the preheat zone, the temperature of the cast film is raised by passage over a series of heated contact rolls until a point, usually about 15Â°C above its Tg, where the material can be readily stretched. Heat transfer calculation indicate that the film may be above Tg for, at longest, only a few seconds but again this can provide an opportunity for crystallisation. For example, undeveloped nuclei which are produced efficiently in the final stages of the casting process are now present to enable crystal growth to proceed immediately upon reheating. Other consideration mentioned previously can also influence the rate of crystal growth during annealing A further complication is that perfect thermal equilibrium cannot be achieved throughout the film. The nature of the preheat design and the thicker edges of the film, inherited from neckdown of the melt from the die, mean that the FWDPH stages will produce a film with a temperature gradient through its thickness and at its edge. These local differences will develop discrete morphologies, which will respond differently downstream; thus, it becomes critical for the preheat stage to heat film rapidly but minimise thermal fluctuation within the material. Again, simple heat transfer models can offer significant scope to optimise the process design. The forward draw stage, which physically stretches the heated polyester film between two nip roll system, is designed to improve its tensile properties in the M.D Stretch ratio of around 3.5:1 are employed, which cause a traumatic effect on both the macroscopic and microscopic nature of the film and thereby raise its tensile modulus and strength by a factor of about three. However, detrimental effects can also arise. Additional variation in thickness of the film and further crystallisation can occur and efforts must be made to limit these. In order to achieve the desired physical and dimensional properties in film at the FWD exit, a considerable level of knowledge has been generated about the material properties and behavior of PET. Thermal properties have been used in heat transfer models, load-deflection and viscoelastic behaviours have been studied to develop constitutive models to describe deformation at high strains, and crystallisation kinetics have been measured to predict film morphology and physical properties either later in the production process or in the finished product. It is now possible from a knowledge of the FWD design, the process conditions and the molecular structure of the polyester, to calculate the change in the physical shape of the web and the stress developed within it, at that stage of the process. Moreover, one can predict the accompanying evolution of both the molecular orientation and crystallinity in the PET. This is a significant achievement since several process parameters, namely temperature, strain and strain rate, act in combination to influence the rate and extent of crystallisation in the film. Through a program of systematic experiments using time- resolved synchrotron x-ray diffraction method, the very high rates of crystallisationthat occur in PET, during and after rapid, have recently been quantified In fact, the behaviour of PET during hot uniaxial drawing can be represented for all condition of temperature, strain rate by the two master curves shown in Figure 3. This work revealed two features about the crystallisation of PET: First, high draw rates, the process of crystallisation commences only after the completion of the physical draw and follows first order kinetics and second, the rate of that process is determined by the temperature and the degree of molecular orientation after stretching. Fig. 3 : Orientation and crystallisation in PET after one way draw. A Orientation b. Crystallisation. Key, 90Â°C, 100Â°C, 110Â°C, 120Â°C. Thus, Figure 3 is a quantitative representation of the dependence of crystallisation on film temperature and molecular orientation after the draw. Figure 3A is critical to the description since it provides a value for the molecular orientation . This is governed by the process parameters of temperature, draw rate and macroscopic draw ratio. Inspection of the mastercurve confirms the popular understanding that low temperature, fast rates and high ratios favour efficient molecular alignment along the draw direction However the experimental data can only be fully rationalised through an appreciation of the role of molecular relaxation. Studies have shown that segmental motion permits the oriented network to relax during and after draw and, under certain conditions, is capable of offsetting completely the effect of stretching. The interplay of molecular alignment under strain and entropically driven relaxation was quantitatively explained in terms of known modes of relaxation for polymers and was shown to relate to the final morphology in the one way drawn film. Work of the sort described above illustrates the nature and extent of transformations that can occur on the molecular level and on the timescale of each stage of the film process. Clearly, similar mechanisms will operate but with different result in subsequent stages of the film production line. Tangible benefits can now be achieved from this knowledge by compiling the kinetic data with heat transfer models of the film in a real FWD environment. It becomes possible to make accurate predictions about the final levels of molecular orientation and crystallinity in PET after the first draw stage of a real film process. Thus, the process engineer can make fundamental comparisons between different production lines and may even redesign the FWD stage in favour of specific attributes of the finished film product. However, close control of the film structure in the FWD step is also critical to the subsequent stages of the production process, where a knock-on effect of creating either well behaved or deteriorating film performance can be seen downstream. In the sideways draw (SWD), for example serious profile loss can be caused through inconsistent morphology inherited from the FWD stage, while the phenomenon of bowing which appears in the heat set stage of the tenter is also sensitive to the same parameter. The tenter oven comprises a series of zones in which air temperature is closely controlled which perform specific tasks on the resident film. The first zone, known as the sideway draw preheat is designed to deliver film at temperature typically between 90Â°C and 110Â°Cand with a consistent morphology across its width and along its length, to the sideway draw stage of the process. Fundamental studies confirm that when uniaxially drawn PET is reheated above its Tg, significant structural reorganisation in the form of secondary crystallisation begins to occur, which is known in turn to affect its physical behaviour Therefore good temperature control across the film must also be provided in the preheat zone, such that not only is the final temperature of the web at the zone exit constant within narrow limits but also the rate of heating has similar for each position across the film. In order that all regions of film follow a similar thermal profile throughout the preheat zone, film thickness and local heat transfer efficiency must be identical at all times across the web. Heat transfer , will , in turn, depend on local air temperature and velocity, which again must be identical in all regions of the zone. In practice, this is difficult to guarantee and instead is compensated to some extent by ensuring that thermal equilibrium is achieved ahead of the zone exit. However, Figure 5. Demonstrates that consistent levels of crystallinity and microstructure across the film will not automatically follow. One- way drawn film crystallises as a function of its FWD history and dwell time in the preheat zone. 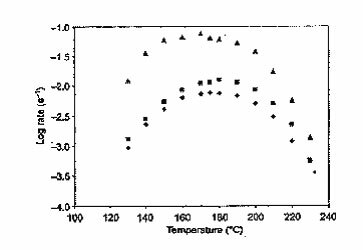 For film 2, this means that areas of the web that reach thermal equilibrium earlier than other will have progressed by the preheat exit to higher levels of crystallinity, which in turn respond differently in the subsequent SWD zone. Similarly, if the final temperature of the film varies across its width at the zone exit, so too its local modulus stress and its draw behaviour in the following SWD stages. Fig. 4 : Film temperature in sideways draw preheat (SWDPH). Key- filmA;â€¦, filmB. Fig. 5 : Crystallisation of one way drawn film. Key : FWDRÃ-3, FWDT 85Â°C, brief 0.114+ FWDRÃ-4, FWDT 100Â°C, brief 0.111. Abbreviations FWD forward draw; R, ratio; T, temperature. Fig. 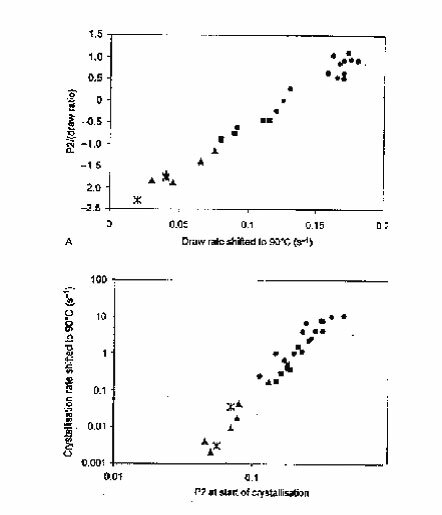 6 : Influence of crystallinity developed in the sideways draw preheat (SWDPH) zone. Key: , SWD Temp 100Â°C, SWD Temp 110Â°C. Fig. 6 shows the dependence of the yield stress of one way drawn PET film on its crystalline content, when strained in the perpendicular direction. Clearly, if the crystallinity in a film web changed sufficiently across its width, the conditions for an even, homogeneous draw in the sideway direction would disappear, resulting in problems concerning the quality of the film. This is supported by experiment and finite modelling. Moreover, the fracture stress of one way drawn film when strained in the TD can be around 75 MPa at 100Â°C; this suggest that, in the worst case, poor control of crystallinity in the preheat zone can have catastrophic consequences in the subsequent SWD zone. 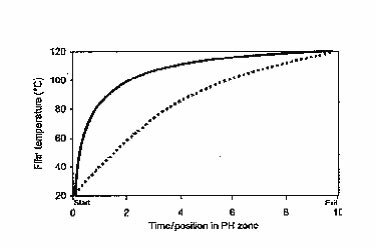 The yield stress described is also directly sensitive to temperature, as shown by Fig.7. Fig. 7 : Influence of film temperature at exit of sideways draw preheat (SWDPH). A similar logic therefore applies when relating temperature control across the web in the preheat zone to the consistency of draw in the SWD zone, quite independent of crystallinity. 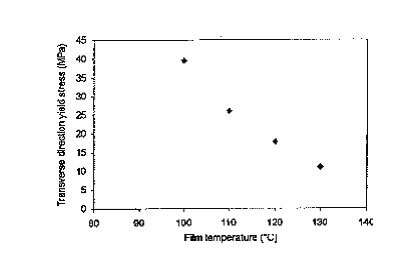 In fact, fluctuation in film temperature should be less than 10Â°C and preferably below 5Â°C at any point in the preheat zone in order to maintain a well-behaved film process. In practice, this presents a challenge since many features of the tenter process design and engineering conspire to cause real conditions in the zone to vary with position and over time. In the second stage of the tenter oven, the edges of the web are led along diverging rails that cause the material to be stretched, for the second time, by a factor of three to four. The object of the SWD step is to develop the properties of the film in the TD, via orientation at the molecular level, to a point where they balance or approximately balance those measured in the MD. As in the first draw operation, the film is stretched above its Tg, which due to restricted molecular motion is now above 90Â°C. However, in contrast to the forward draw performed under conditions of constant load, the TD stretch is carried out under a constant rate of deflection. The SWD is usually continued beyond the point of initial stress hardening, which helps to minimise any added profile variation across the web. Fig. 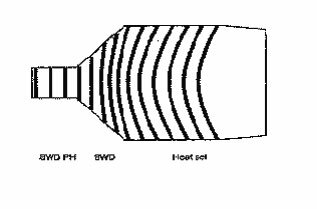 8 : Development of the macroscopic bow in film Abbreviations: SWD, sideways draw; PH, preheat. A more interesting complication is a poissons ratio effect which generates a stress in the film at this stage in the process that is perpendicular to the direction of draw namely along the MD. As a result, the speed of the film at its centre momentarily falls below that at its edges and the physical retardation of the centre of the wed relative to its edges remains throughout the rest of the process. The classic demonstration of this feature simply involves marking the surface of film with lines parallel to the TD prior to entry to the tenter oven as indicated in figure. 8. The distortion of the film is then highlighted by the surface markings, which appear curved or 'bowed' on the web when it emerges from the tenter. The film therefore experiences a combination of strains fields in the SWD zone from simple elongation at its centre to a mixture of elongation and shear nearer its edge. Not surprisingly, the underlying microscopic structure which develops from this process history is equally complicated yet it is clearly necessary to elucidate that structure in order to establish its relationship to properties. One of the most powerful techniques that can be applied to the problem is the measurement of X-ray diffraction (XRD) in Figure 9,a series of wide angle X-ray scattering (WAXS) intensity plots are presented which were produced using specimens collected from the centre of a PET film at various points along the SWD stage. Each trace is a plot of intensity at 20=17.7Â° which corresponds to the reflection of the (010) plane in the PET crystal lattice and is used to indicate the relative abundance of crystals at a particular orientation By rotatines the specimen in the beam, the so-calledChi plot is produced, which shows the distribution of orientations of the PET crystals in the plane of the film. Typically, four maxima are seen through 360Â° corresponding to the preferential alignment of the two crystal populations, along the MD and TD. From this and a knowledge that overall level of crystallinity remains relatively constant during the sideways draw and that the average crystallite size increases through the zone it has been possible to establish the likely mechanism by which the biaxial morphology of PET film evolves. In the Mechanical field of the SWD, large crystals present from the first FWD stage appear to survive while smaller, less perfect crystals are destroyed. 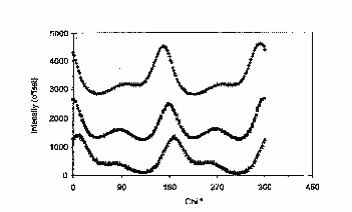 The rotation of crystallites from MD to TD dose not account for the appearance of new crystallites aligned in the sideways direction. Rather the second population is generated by a mechanism similar to that in the FWD namely nucleation that is enhanced by an apparent increase in supercooling from orientation and growth. The effect of bowing by the film on its underlying microstructure can be demonstrated to similar effect using the Chi plot fig. 10 shows the result recorded for a specimen of film at three positions across its width the principal alignment of the two crystal populations has clearly rotated away from the MD and TD as a result of the shear forces described previously. In practice, the extent of this rotation is seen to increase across the film from centre to edge, in accordance with the increasing angle of bow. Although this is a qualitative description of the evolution of microstructure in the SWD much of the mechanism has been quantified by post analysis of film and work continues to establish the kinetics of the transformations, using time resolved X-ray synchrotron methods. The early results presented in table 1 demonstrate that the rate constant for crystallisation in biaxial film immediately after stretching, is less than that for uniaxially drawn film. (A.Mahendrasingam and C. Martin, personal communication.) However the rate of crystallisation is significant on the timescale of the process and critical at the elevated temperatures that the system will experience in the final, heatset zone of the stenter oven. Figure 10. Crystallite orientation across a film. (Film draw ratios were Keyu. Near left edge.n Film centre s: near right edge. Once again knowledge of the fundamental behavior of the polyester, its molecular alignment, molecular relaxation and crystallisation, can be combined with heat transfer and constitutive models of the film process. This offers the process engineer a complete description of the material throughout and after the SWD stage, and provides predictions of behavior and property in support of product development. The final stage in the stenter oven is designed to develop a crystalline morphology in the film that will retain the improved mechanical properties from the drawing stages and that is more stable over time and at temperature. The heat set or crystallisation stage of the process comprises three or more regions of the tenter oven, each with independent temperature control and the ability to adjust the lateral dimension of the web. Thus film can be treated to a range of thermal and strain programmes to optimise its final properties. Temperatures of the film can exceed 230Â°C and, although residence time may be only a few seconds, this is sufficient for density changes equivalent to arise of 30-40%in crystallinity to occur. On the same timescale, the non-crystalline regions of the film can exhibit significant molecular relaxation with or without accompanying macroscopic strain relaxation and chemical reactions such as ester interchange may even occur. Fig. 11 Differential scanning calorimetry (DSC) of commercial PET film. Much has been reported about the nature and mechanism of the structural change in polyester film under conditions typical of a heat set stage, and some articles offer excellent reviews for further information. 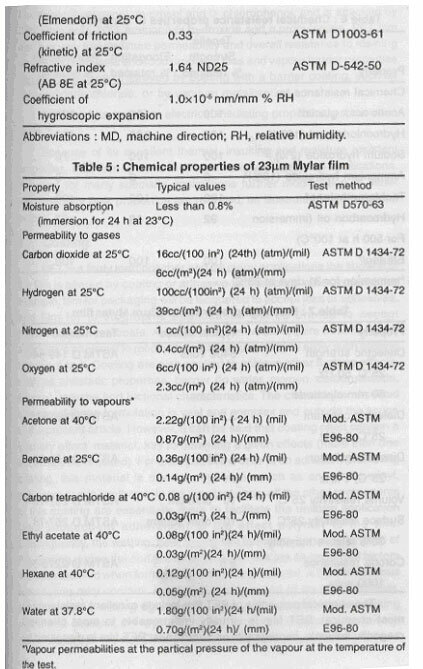 However, it should be recognised that the exact thermal history of polyester film in a commercial heat set zone is often difficult to mimic in the laboratory. A variety of treatments, such as toe in the strain relaxation in the TD and MD haul off tension and cooling rate are superimposed on the biaxial film and their interplay can cause complex and often subtle effects on the structure and behaviour of commercially manufactured film. 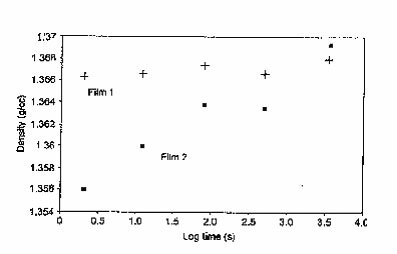 For example curve A in figure 11 is the differential scanning calorimetry (DSC) trace of PET film approximately two years after manufacture. The trace shows a pronounced endothermic peak in the region of the TG caused by the reduction in free volume with time. Curve B shows the corresponding response by similar film immediately after manufacture, before the ageing process has progressed. From this perspective film which emerges from the heat set stage is metastable. A less subtle and often more important behavior, which is exhibited by film as a consequence of the history of the heat set stage, is depicted in Table 2. Unless all physical anisotrophy can be removed from the non-crystalline fraction of biaxial PET film, the product will undergo residual shrinkage at elevated temperature. By managing both the film temperature and a relaxation of strain (known as toe in) during the heat set stage, it is possible to achieve considerable control of this film property. However, this control cannot be managed at all temperatures during exit from the stenter oven and in practice some degree of frozen-in strain will exist inthe final film. Both phenomena underline the point that the heat set of the process does not cause true structural equilibrium to be achieved in the film. A stable structure may be closely approached at the high temperatures of the stenter oven but this is not the equilibrium structure under ambient conditions. Upon exiting the heat set zone and cooling rapidly, the film material is unable to equilibrate structurally to its ideal state at room temperature and consequently, will display properties which are both time and temperature dependent. Nevertheless, the film which exits the heat set stage of the stenter oven has completed its primary manufacturing program and all knowledge about the structure and composition at this point is of value to predict or guarantee its final performance. Thus, a wealth of information has been gathered about the structure property relationship of polyester film. Furthermore, process and material constitutive models, which are increasingly powerful, are also providing routes to predict specific properties. For example, understanding, predicting and controlling the dimensional stability of commercial polyester film has always been of key importance and this property is most strongly influenced by conditions in the final heat set stage of manufacturing. Similarly, several other properties of the finished film which depend on crystallinity or amorphous orientation will be highly correlated to the heat setting conditions of the process. However, current and future applications are demanding film with increasingly stringent specifications. Consequently, it is becoming more important to account for the cumulative influence of all stages of the production process on final structure and properties of film, in order to manufacture to the required standard. Clearly, the strategy to consider the process as a whole is approached with the aid of statistical and phenomenological models. However, as this capability evolves and emphasises how many features of polyester film are primarily correlated to its chemical composition, it also becomes necessary to enlarge the process property model and include information about the nature of the polyester. It can be argued that the production of high quality, consistent and stable rolls of film depends on the successful management of the film web from an early stage in the film line. Throughout the process, it is necessary to maintain tension in the film to stop it from sagging, wrinkling or ultimately wrapping around rollers. Good control of the speed drives through the unit is therefore essential. Overall speed is referenced to that of the casting drum, so that adjustment are automatically made to all drives when the casting drum speed is changed. In practice, each drives is referenced to the preceding drive, so that speed adjustment at any point in the line result in adjustment of all downstream drives. At critical points in the line notably between casting and forward draw, forward draw and tenter and tenter and wind up, the film tension is measured and the speed of the downstream drives adjusted usually automatically to maintain a preset tension level. When the film leaves the tenter, good control of tension is necessary to maintain good film flatness. The film is pulled from the tenter by the 'haul- off nip'. Just before this nip, the film passes over a non-driven roller mounted on load cells in order to measure the tension in the film passing over the roller. Alternatively, a dancer roller is used, which relies on displacement from a balance point to determine the deviation from a set point tension. During initial thread up of the film, the haul off nip is run in tension control mode. While the film is slack around the 'tension 'roller, the haul off nip will a speed up to take up the slack in the film and restore the film tension. During normal running, the tension roller is used to indicate web tension and may be used to control the half off tension. The haul-off nip consist of two rollers : a driven chrome plated steel roller and a rubber-covered steel nip located in a pneumatically operated level arm. The nip force between the two rollers is used to prevent slip of the film over the roller surfaces, and must be uniformly loaded over the width to prevent film distortion and the potential for creasing. Fig.12 : Take up(web transport) section. Some lines have a single winder, with the full width of film from the tenter would up as a mill roll on a steel core for later batch slitting. Mostlines manufacturing film above 23 or wide thinner film lines above 3 m in width, carry out slitting in- line and subsequent winding of two or more reels at separate winding stations. Generally (but not always). Thicker films are knurled at the edges before winding. Knurling thickens an area at the edges of the film so that it supports the wound in tension when the film is reeled. It also allows a layer of air to lie between adjacent layers of film, to prevent any surface damages by one layer moving relative to the next. Knurling heads are mounted on a cross-beam and can be positioned across the film web, where it will subsequently be slit. They consist of a knurling wheel, backing roller and a method of removing any debris generated. The knurling wheel is usually a narrow steel wheel with a patterned projection. This is forced against the film, which is supported on the other side by the wider backing roller. The pointed surface distorts the film by the amount of penetration of the pattern and, therefore, raise the previously flat surface. Both knurling and backing wheels are held in position by pneumatic cylinders. The knurling pressure is controlled pneumatically according to the height of film distortion required. 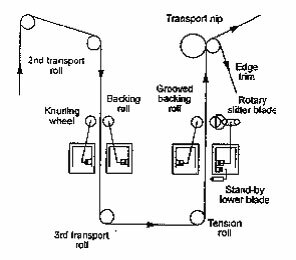 If an interruption to the process, such as a split in the film occurs, the knurling and backing wheels are deactivated and move apart to prevent mechanical damages and subsequently re- threading to occur. Fig. 13 : Knurling and slitting station. The slitting station is positioned after knurling and is designed to slit the main web into the width of the film required for each winder. Slitting heads and sometimes backing blades or rollers are supported on cross beams similar to the knurling heads. They are driven to precise location across the web. The knurling, slitting and backing systems must exactly match positions across the web and are usually geared together. Film is slit by various method, commonly employing razor blades for thinner films and rotary shear for thicker films. It is important that the slit edges of the film is flat to prevent a 'high edge' build up and that generation of slitting debris is kept to a minimum. The razor blade is simplest design and is sometimes oscillated so that the cut position moves along the blade edges. Rotary shear is more complex to set up. It consists of two circular blades, which are pushed together pneumatically. The small overlap and angular displacements between the blades needs to be precise; however, the quality and cleanliness of the slit edges for thicker film is far superior. A final consideration of the slitting stages is the reclaim and recovery cycle. The film is and close to the clips in the stenter oven is very thick and cannot be wound in. It is slit off at the wind up and sent to a recovery process. Here, it is is combined with scrap film and is either cut up into flake and compacted into particulate form or is either cut up into flakeand compacted into particular form or is re-extruded and formed into pellets. This reclaimed polymer is either fed back with the virgin polymer at the start of the film process or is fed into the CP process. At the end of the tenter, the film may either be wound into reels on cardboard cores to be sent directly to the customer as 'direct hand over' (DHO), or into mill rolls, which are subsequently slit out of line on a separate 'slitter rewinder'. Much DHO film is knurled before winding, such that the winding condition are then less demanding. Some DHO film and almost all film slit on slitter rewinders are wound without knurl. Under these conditions, the winding conditions and surface properties of the film have a major effect on the reel quality. Winding conditions need to be carefully controlled to produce a reel free faults and stable enough to be handled through packing, distribution and the customers' process. Some tension is required to wind film onto a core and prevent looseness and flapping of the film through the machine. Layers of some smooth filmstick (or 'block') to each other causing the film to 'buckle' on the reel and giving distortions in the film when wound. For this reason, knurling of the film is employed. When 'filled' film is wound into a reel, air is drawn in between the layers as the surface roughness keeps layers a small distance apart. This provides a 'cushion', enabling some stress relaxation with a reduced risk of buckling, and also reduces effect of variations in the film thickness, which can locally distort the reel of film. If the winding speed is increased, more air is carried along with the film and entrained between the layers. When too much air is wound in, the layers of film will move sideways relative to each other causing the reel to 'telescope' or 'dish'. To avoid this, the film is wound with a 'lay on roller'. Which the film passes around before contacting the winding reel can be varied to alter the amount of air entrained. Normally. This pressure is kept constant through the winding of a reel but it will be increased if, for example, the winding speed is raised. The tension applied to the film web during winding is also critical to good slit reel formation. Normally a form of 'taper' tension is used, where the tension is reduced in a controlled manner as the diameter increases. 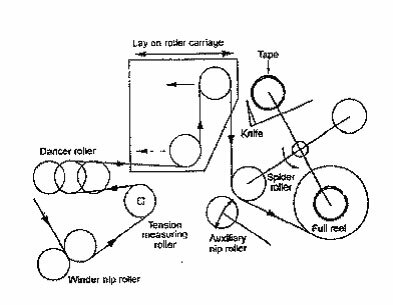 In practice, although called taper tension, open loop torque control is used, where the power To the winding motor is increased as the diameter increases but not to the extent required for constant tension winding. It is also normal to make some compensation for inetria and speed effects when accelerating and decelerating at the start and end of reels. The film in and close to the clip is very thick and cannot be wound into film. It is slit off at the wind up and sent to a recovery process. Here it is combined with scrap film and is either cut up into flake and compacted into particulate form or is re-extruded and formed into pellets. This reclaimed polymer is either fed back in with the virgin polymer at the start of the film process or is fed into the CP process. The quality and consistency of the feedstock can have a significant effect on the efficiency of the film process, namely on the complicated interrelationship between polymer, process and properties. Subtle changes to the polymer feedstock can render the polymer unfilmable unless the film process parameters are altered to accommodate this change and these issues are magnified if changes are made to the polymer formulation for the different grades of the film produced. Because of the interdisciplinary skills required to understand and manage these changes through the film process, the '3Ps' interrelationship is often overlooked in discussions of this type. For this reason, it is being treated separately rather than included in the description of the process. The polymer architecture in is controlled the first place by the formulation, which will dictate the basic class of polymer and the chemistry and physical properties associated with it. Superimposed on this, however, is a series of subtle effect that can have a significant influence on the properties of the polymer. The molecular weight of the polymer, the molecular weight distribution, whether the polymer is linear or branched, filled or unfilled, the type and level of filler, and the type of end groups all contribute to the characteristics of the polymer. The polymer architecture and recipe in turn whether the polymer is crystalline or amorphous and, if crystalline, the rate of crystallisation and the level of crystallinity. The polymer architecture also dictates the conformational change that the polymer can undergo, and thus influences the Tg and Tm. These influences on the molecular morphology contribute to how the polymer behaves in the melt and to the polymer's rheology. Polymer and process, by virtue of the interrelationship described above essentially determine the properties of the finished article, namely the mechanical properties, the clarity, the dimensional stability, the environmental resistance, the usage temperature, the barrier properties and so on. The list of effects described under the three headings above is by no means complete but is meant to illustrate how a subtle change to the polymer can have knock on effects to process and properties. In extreme cases, these subtle effects can render the polymer unprocessable. The interrelationship can be illustrated in more detail by revisting the film process outlined above. Extrusion. The purpose of the extrusion stage is to melt the polymer and provide a constant flow of molten polymer to the die. Any variation in the extruder conditions will cause fluctuations in the output and give variations in the cast film. These variations in thickness will last through the process and show up in the finished film this is obviously undesirable. In addition to the process affecting thickness variations, polymer parameters that influence the rhelogy will also affect thickness for the same reason. Therefore, variations in molecular weight and molecular weight distribution and subtle alterations to the PET architecture that influence Tg and Tm, such as copolymer level or diethylene glycol content, can potentially influence thickness. The degradation reactions that the PET can undergo are influenced both by the polymer recipe and the extrusion condition - these can lead to discoloration and surface defects in the film. 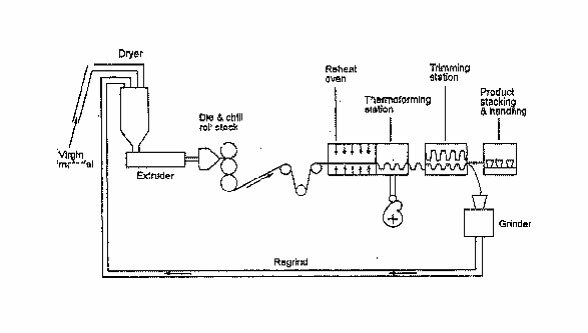 Changes in molecular weight and branching due to degradation, and build-up of degraded polymer in the extruder will also influence how the polymer behaves in the melt and thus the stability of the extrusion process. Casting. Polymer factor such as copolymer level, filler level and molecular weight which influence crystallisation rates will also have a significant on the casting process. Drawing. The drawing process is carried out above the Tg of the PET, and thus the polymer factor outlined above, which influence Tg, will have a subtle effect on the drawing process and therefore the mechanical properties of the film. Heat setting. Polymer factors that influence the crystallisation characteristics will also have a significant effect on the heat setting process and therefore the final film properties such as low shrinkage and dimensional stability, chemical resistance, flatness and delamination. Wind up. The finished film is wound up after the heat set process. It is essential to obtain uniform tightly wound reels. This stage of the process is dominated by process conditions but even here the windability of the film will be affected if the inherent stiffness of the polymer has been altered for example by the presence of comonomers. In some cases the polymer factors dominate and in other cases the process factor dominate the interrelationship of the 3Ps. 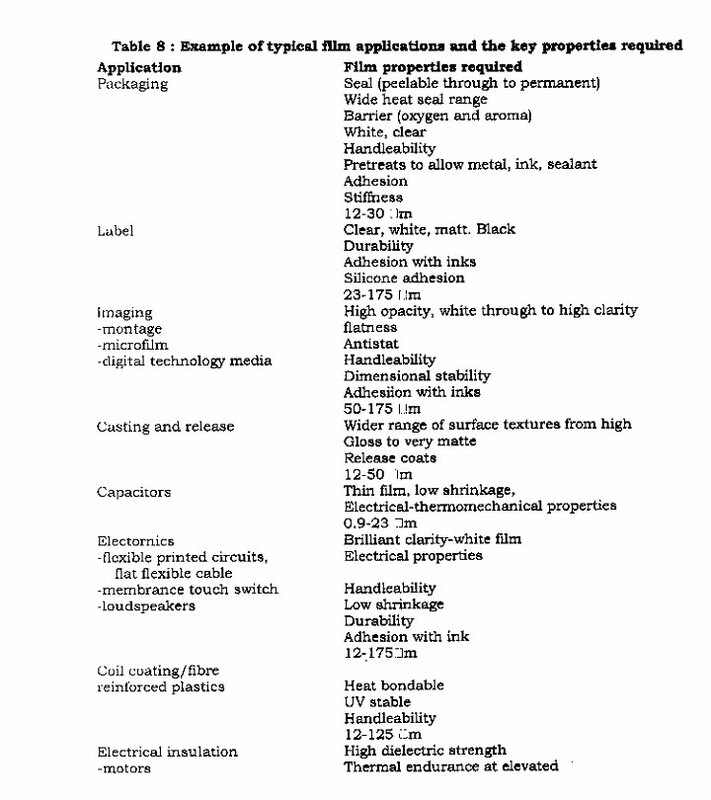 Furthermore, specific process or polymer properties can have a positive effect on some final properties and a negative effect on other, for example, increasing the draw ratio increasing the ultimate tensile strength but has a detrimental effect on shrinkage, and increasing the crystallinity of the polymer increases the modulus of the film but can lead to web breaks during the filming process. These issues have to be understood and managed to successfully introduce new polymer variants to the film process or when altering process conditions to achieve new effects. The film process described produces rolls of PET film that have the properties required for a standard PET film, namely : high mechanical strength, good flexibility, excellent visual properties, flatness and dimensional stability and a thickness of 0.6-500?m The thermal characteristics of PET film enable it to retain physical, chemical and electrical properties over a wide temperature range, with good resistance to the effects of heat agening up to 150Â°C. 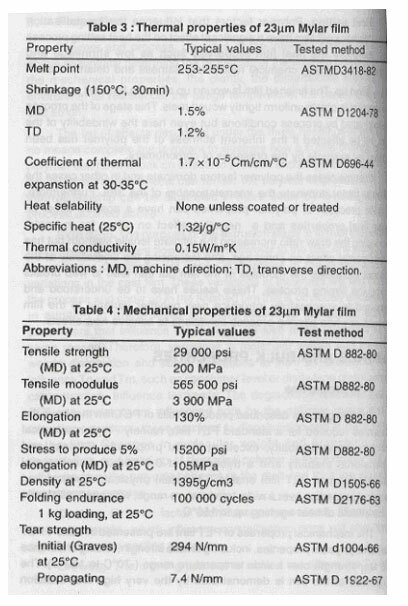 The mechanical properties of PET film are presented in Table 4 PET retains its physical properties, including tensile strength, folding endurance and tear strength over a wide temperature range (-70Â°C to 150Â°C). The toughness of the film is demonstrated by the very high tear initiationstrength. PET film does not contain plasticiers, a key advantage in the area of packaging consumable items, and does not become brittle with age under most conditions. The chemical properties of PET film include excellent resistance to most chemical. PET film is virtually impermeable to most chemical reagents, solvents, impregnants and varnishes. PET film is dissolved by hexafluoro-2 propanol, m-cresol and 0- chlorophenol, and is attacked by 35% nitric acid, 10% ammonium hydroxide and n propylamine. PET film also has very low moisture permeability and overall resistance to staining by various chemicals and food products. Gas and vapour barrier properties can be significantly improved by coating with a barrier coating, such as polyvinylidene chloride, or by vacuum metallisation. 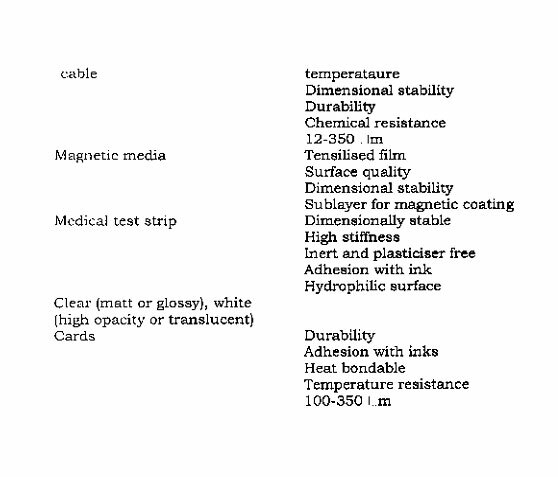 PET film has excellent electrical insulating properties, as shown in Table 7. Because of its excellent thermal, insulting and moisture resistant properties, PET film is used in a wide variety of electrical applications. However, for many specialty applications further modification of either the surface or bulk properties are required, as illustrated in the sections below. PET is a fairly inert polymer and for many applications the surface of the film is altered by coating or adhesive lamination to other material, for example, film for packaging will be lacquered to accept inks or adhesives, and film for photographic applications will be primed to accept photosensitive overcoats. An untreated film would require treatment with aggressive chemical to modify the surface sufficiently to allow such coating to adhere to it. Coating are also applied to achieve other surface effects, such as antistatic properties, barrier (to water, oxygen, carbon,dioxide, flavour), release and frictional characteristics. The chemistry and colloid science of these formulation is vast and complex and outside the scope of the present article. However, it can be said that coating often contain a 'primary effect' material, key to obtaining a given effects (more than one effect may be required). For example, in the case of an adhesion-promoting coating, this material is often a copolymer, such as an acrylic, vinyl, polyester or polyurethane. In the simplest case, all the other components of this coating are essentially there to facilitate the uniform application (and subsequent adherence) of the effect polymer to the film. Consequently, the wetting, flow, drying film formation and cure kinetics of the coating during the surface treatment process are all-important factors to be considered when formulating the coating material. A typical aqueous formulation may contain a solution or dispersion of an effect polymer, together with a wetting agent (surfactant or co solvent), a cross-linking agent and catalyst, pH regulator, a film former (coalescent, plasticiser), deformer, antiblock, etc. Clearly , a given ingredient may have an influence in more than one of these areas. Wetting of the PET surface (~43 dynes/cm) may be facilitated by flame or corona discharge treatment prior to coating. The cross linker is a species that is simultaneously reactive towards the PET surface (hydroxyl and carboxly end groups ) and the effect polymer; multifunctional epoxides, aziridines, isocyanates and melamine formaldehyde resins are commonly used. PET film is commonly coated either 'in line' or "off-line". In line coating usually involves aqueous based material and is carried out between the forward draw and before entering the tenter, while off-line coating involves unwinding and priming the surface of preformed film reels with aqueous or solvent- based coating. In both cases, the coatings may be applied to one or both sides, and some products have different coating applied to either side of the film. Coatings are mostly applied by offset gravure or by direct gravure coatings. Coat continuity and uniformity are important to ensure that required properties are obtained. Uniform dry coating thickness as low as ~10 nm can be routinely achieved in line, while off-line coating can be 10-100 times thicker. Too much coating on film is to be avoided in the in line process, since the water has to be dried off in the tenter preheat section and the film will only heat up to the required temperature for the SWD when it is completely dry. Excess wet coat thickness may cause the film to be at too low a temperature when drawing starts, resulting in poor profile and possibly breakage of the film web. Applying excessive amounts of coating can also resulting in unacceptable film optical properties, such as coat non-uniformly, haze and yellowness. Furthermore, because the tenter process often involves recycling some film, and some of this may be coated, thick coating may adversely effect the color, clarity and extrusion characteristics of the recycled polymer melt. Off-line coating does not have this restriction on the chemistry and thickness of the coating; the off -line process is better suited to coating high Tg coating material (as the coating is not drawn), and those requiring longer cure schedules. Co-extrusion is used to produce a film with two or more different polymer layers, so that one or both surfaces of the film have different properties to the 'core' polymer. In addition, co-extrusion allows manufacture of products with layers thinner than can be made and handled individually. Co-extrusion provides a means of flexibly configuring a wide range of film laminate structures which cost effectively meet product requirements. 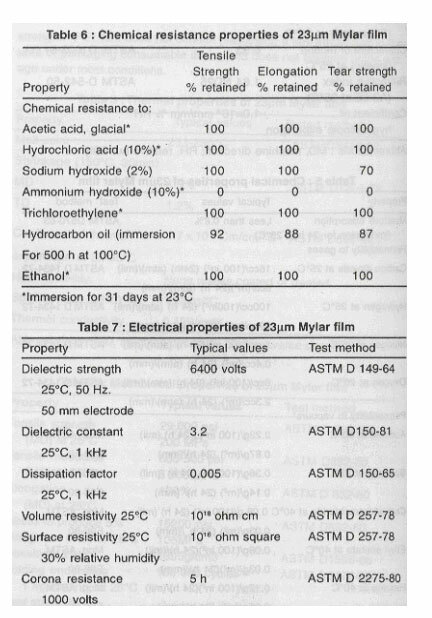 An example of a co-extruded film is Myler 850, in the production of which a lower melting copolymer containing isophthalic acid is extruded onto a standard base film to give a film that can heat seal to itself and heat seal to thermoformed APET/CPET trays and APET coated board. It will also heat seal to various other substrates, including polyvinylidine chloride. (PVDC), PVC, paper and aluminium foil, but it does not heat seal to polyolefins. The co-extruded layer is about 15% of the total structure and by tailoring the copolymer chemistry a wide heat seal range, from 140-220Â°C, with outstanding hot tack properties can be obtained. The copolymer, if extruded as a film itself, would not have sufficient strength and the base PET homopolymer provides the mechanical properties required. The sealable surface of the film also acts as an excellent prime for water based lattices. This film can be exploited in various ways, for example the film can be PVDC coated from an aqueous dispersion by converters to produce a high barrier laminating film. Further example of co extrusion application include the use reclaim polymer in the center of films, so that more expensive virgin polymer can be used sparingly to provide surface properties. The basic co-extrusion process consists of the generation of two or more melt streams and their confluence in the melt phase. The number of separate extrusion system is determined by the number of polymer types, typically two but occasionally three and exceptionally up to ten. Each polymer type to be incorporated in the structure is separately melted, pressurised and (optionally) filtered in parallel extrusion system before flowing into the co-extrusion hardware. The optimum method of bringing the separate melts together depends primally on their respective flow behaviour. The melt layers must remain distinct but well bonded in the process, from the point (s) of confluence through to solidification. There are basically two hardware configuration in use for common polymer the multimanifold die and the injector block. (Combinations of the two are also possible for complex structures). The multimanifold die is used when the viscosities of the melts are dissimilar, or low, or where there are many streams to combine. The stream are brought together at the die, just prior to solidification, thus allowing virtually no time for the weaker melts to be distorted in the short region of laminar flow. Co extrusion profile (the relative thickness of layer across the web) ia a key process requirement in many products. However, multimanofold dies are generally expensive, complex and can be difficult in incorporate in thermoviscous profile control system. Polyproylene filmprocesses typically utilise multimanifild dies because of the tendenc y of that polymer to encapsulate (that is distort the shape of) the secondary polymer in the laminar flow regions. The second option, used extensively with PET, is injector block technology. This is restricted to two or three layer applications, injector block systems consist, in basic form, of a main melt channel with one or two side entries through which secondary melts flow. The injected melt(s) then flow side by side with the main polymer, in the same pipe, towards the die. The mechanism is most effective when the viscosities of the melts are similar. The greater the viscosity difference the more pronounced will be the distortion of relative profile. For many packaging applications, however, profile distortions up to 10% are acceptable, are therefore the process has a degree of robustness towards viscosity variations. The basic injector technology can be enhanced by the addition of profiling cams and fins at the point of sidestream entry, which contour the flows in a way that leads to a more uniform profile. Adjustable cams can be included, which provide for in situ optimisation. Cam design is particularly important for uniform profile. Typically, cams take the form of a rectangular slot. A particular requirement for tenter film processes is often to avoid having sticky film under tenter clips, and hence to provide web edges clear of secondary polymer. Cams can be designed which restrict the application of secondary polymer to a centre width of the film web. However, the maintenance of uniform profile in such designs is very difficult, and companies that have developed good designs are often reluctant to share them. It is generally true to say that the wider the film die, more difficult it is to achieve good profile and clear edges. A further enchacement to injector block technology is to include melt routing flexibility through reconfigurable transition block/ flanges. This gives the optimum to redirect polymer stream to any entry point of a multilayer block through a simple operator procedure. Co extruded products that have low conversion efficiencies and have to include recovered scrap may present particular problems. Many packaging film applications can tolerate inclusion of reclaim in the base polymer layer, but those which cannot neccessitate either scrap dumping or expensive chemical separation. Second, to modify bulk properties: although mechanical properties, such as softness, stiffness and toughness, can be addressed, it is most common for optical properties to be modified via particles. Opacity and whiteness are generated by two discrete mechanisms. Simple pigmentation (light scattering from the practical-polymer interface) can be achieved using similar titanium dioxide technology to that employed in the fibres and coating industries. It is, however, more common for the anatase crystal to be employed, since this is a less abrasive pigment than the more strongly scattering rutile. The second mechanism involves using the additive to generate micro-voiding during the film draw. The additive can be inorganic, for example barium sulphate or calcium carbonate, or polymeric, for example, polypropylene. In this mechanism, the opacity is derived from scattering between the polymer and the void. The use of micro-voiding confers the potential advantages of a softer film of reduced density. Standard PET film from the tenter process will shrink by 1-3% after 30 min at 150Â°C. For the high level of accuracy required by Membrane Touch Switch printers, 0.1-0.2% shrinkage is required. In order to meet this, the film is unwound and passes through a carefully temperature controlled oven, w ith almost no tension in the film. The amount of residual shrinkage in the film after this process is typically 0.1% in the MD and 0.06% in the TD. Further examples of PET film use in packaging are: films for convenience, such a lidding, where easy peel through to permanent seal, to a variety of container types, is a key feature in ready meal applications; and films for freshness, such as in meat and cheese packaging, where barrier and clarity are the key feature required for modified atmosphere to achieve excellent product shelf-life. PET can be converted readily into container suitable for a wide range of packaging application by thermoforming of extruded sheet. The technology can be considered as comprising two process stages. In the extrusion stage, the PET pellets are melted in a continuous screw extruder and the melt passes to a sheet die ideally using a gear pump to control flow-and then on to a chilled three roll stack, where the sheet is quenched rapidly into an amorphous cast sheet. The next stages reheat the sheet to the required temperature using an in-line, fully integrated or a separate machine, and the sheet is thermorformed into the finished container. Standard process conditions are used for extrusion of PET into sheet. The polymer pellets must be fully dried prior to processing, with air having a dewpoint below-30Â°C. This is recommended to ensure that the polymer pellets have a moisture content of less than about 10 ppm, to minimise degradation in the melt due to hydrolysis. The molecular weight of the polymer should be high enough to ensure reprocessed edge and web or skeletal regrind from the sheet. All regrind should be dried before re-extrustion. Levels of regrind up to about 60% can be used and should be maintained at a consistent level for the process. PET will show a small decrease in viscosisty during extrusion and a high addition of regrined will give a sheet with low viscosity. Inclusion of regrind at variable levels may influence the resin melt out characteristics. PET pellets are plasticised using a continuos screw extruder of a suitable screw design. Melt temperature should be 270-285Â°C, and should be kept as low as possible to avoid degradation and generation of acetaldehyde (AA). It may be necessary to use a metering pump to ensure a uniform delivery of polymer melt and to minimise dimensional irregularities in the sheet. Static mixers can sometimes be used to reduce variability in intrinsic viscosity resulting from inadequate mixing of virgin and regrind material. Dies for sheet are flat, using either fixed or flex lip opening. Flex lip gives a better range of lip opening to produce sheet of required thickness, while fixed opening dies are more limited but give better guage and temperature control. PET melt should be cast from the die onto a three stack with chilled feedwater to the rolls The calendering system is run with a melt bank in the nip area to produce a uniform polished sheet. Rapid quenching of the melt is essential to ensure that amorphous sheet is produced with high glass, thansparency temperatures will vary between 10Â°C and 65Â°C , depending on the throughput and sheet thickness. The thickness of sheet cast will be influenced by extruder output, die lip opening and casting roll speed. From the the roll stack, the sheet can be transferred to a turret winder via edge trim slitters. Sheet can be transferred directly from the roll stack to a reheat oven and thereformed in-line, or it can be wound and stored for forming at a later data. In direct processing, edge and web scrap is usually reground in line and transferred back for redrying. PET can be thermoformed on most conventional equipment. The forming condition depend on the specific container design and the degree of orientation. Low pressure container need a shallow-to-medium draw process, while for pressure containers suitable for carbonated drinks and when good barrier properties are required, it is recommended that a deep draw process is used. The deep draw process induces a high degree of orientation into the container wall, which is container, with stretch ratios up to about 2.5:1 in the axial direction, can be formed using vacuum (10 mbar) or with a combination of vacuum and compressed air (10bar). Deep drawn containers require plug assist technique. The type of plug and conditions will vary depending on the sheet thickness and the stretch ratio. Stretch ratios up to 3:1and sheet thickness up to 1.5mm can use a cold nylon plug or polymer-coated metal plug. Deep drawn containers require oil-heated brass plugs with a temperature between 80Â°C and 110Â°C. Sheet produced in high IV PET will require the higher plug temperature. The sheet should be heated on both sides using top and bottom heaters. For temperature of the sheet should be reheated between 90Â°C and 110Â°C; the deeper the draw and higher the PET IV, the higher the reheat temperature required. PET can be modified with nucleating additives, including polyethylene and polypropylene polymers such as low-density polyethylene (LDPE) and linear low density polyethylene(LLDPE), which are incompatible with PET but which at low levels of addition (usually about 5%) can induce rapid crystallisation of PET during reheating and the forming process. Fast crystallising PET grades, called CPET, are specially formulated for the production of opaque containers, like ovenproof and microwaveable trays. CPET grades can be extruded on conventional sheet lines but are thermoformed into heated mould, which heat sets the CPET container. Mould temperature are about 160.C to optimise the crystallisation of CPET, with about 2s contact with the hot mould, giving an overall cycle time of about 5s. The clear sheet becomes milky white and opaque when reheated at 120-145.C, which indicates that crystallisation has occurred and it is ready to be formed. Uniform heating is critical to ensure that the finished container is uniformly crystallised. Container that are not uniformly crystallised will tend to wrap and distort when heated in an oven. Overheated sheet will produce too high a level of crystallinity and poor forming, while insufficient crystallinity will cause sticking in the mould. The ideal crystallinity range in the final container is 25-35%. Forming require vacuum, pressure and plug assist, as well as a combination of these techniques. The container can be cut from the sheet when it is below 65Â°C using heavy duty presses, matched dies with close tolerance fit, and sharp cut edges. Dual ovenable plastic packaging for cooking in microwave and conventional ovens was first commercial in the mid 1980s. CPET grades are available from Eastman chemicals, as well as a more heat resistant PCTA copolyester, 'Thermx'. The other major polymer producer is M&G (ex Shell), and Dupont and kosa produce CPET grades. The PET includes a nucleating agent which is incorporated to promote the very fast crystallisation needed for manufacture of high temperature resistant container. High crystallisation ensures good dimensional stability of formed trays at high temperature when cooked in an oven. Control of the level of crystallinity enables processors to produce trays which withstand temperature extremes. High crystallinity induces poor impact properties; processors compensate for this with a co extruded sheet, nip polished during extrusion to improve impact properties. Impact modifiers and nucleating agent can be added to the PET to improve low temperature impact properties. CPET trays are designed to be used over a wide temperature band, from freezer storage (down to -40Â°C) to oven cooking (at 240Â°c). The addition of impact modifier polymer can improve the impact strength at least twofold at ambient temperature, and up to fivefold at freezer storage temperature, compared to standard CPET. A variation on CPET for packaging is expanded PET (EPET) for food trays, which can be deep drawn and are rigid enough for most foods,including frozen foods. An ethylene vinyl alcohol copolymer (EVOH) core layer co-extruded in the EPET structure provides barrier protection and an adhesive layer bonds the complete structure . The expanded material achieved using a proprietary technique requires modification to extrusion equipment to ensure uniform distribution of the foamed material. Foaming can be achieved with an inert gas blowing agent. The EPET material can save up to 50% on weight compared to conventional CPET. Other technique for extending shelf life include the incorporation of oxygen scavenging additives. CIBA have now acquired the 'Amosorb 2000' range of inogranic absorbers developed by BP Amoco, and market the range under the trade name 'Shelfplus'. Technological developments over recent years have included the 'Melt-to Mold' system offered by Lawson Mardon Therma Plate Corp. This process has an in line rotary drum thermoforming process, where CPET sheet is extruded in the melt phase and fed directly onto the surface of a revolving drum, then into the thermoformar. The continuous process saves energy, the containers have better defination, and better process consistency is achieved. The technology offered includes modified polymer as part of the CPET material. The improved morphology results in smaller crystals, which can improve the gas barrier properties of CPET structures compared to conventional material. Data on CPET trays produced by the 'Melt- to- Mold' technology claim that oxygen permeation is about five times better than that of standard co-extrusion CPET/APET structures and there is a 20% reduction in thickness. Impact resistance is also improved up to fourfold. Other advantages claimed are lower container shrinkage, improved dimensional stability, and improved heat sealing properties and double seaming integrity. Co extruded CPET APET with the amorphous PET as the inner layer hermetically seals to the PET film lidding material before retorting. Brown Machine offer various advanced system designed for: quick mould change, advanced oven control, process flexibility for quick changes, cooling programmes for faster cycle times, high speed vertical trim press for extended die life and quick and easy change. The process of making biaxially oriented polyester film is complex and requires a detailed understanding of the interrelationship between polymer properties and process to give the desired final properties in the film. The unique blend of properties of PET film makes it an extremely versatile product and the growth in the films market is predicted to be above 5% per annum. However, this masks the fact that some areas, such as packaging, industrial and electrical applications are growing at a greater rate, whereas the growth in the more traditional markets, such as magnetic media or graphic arts materials, is more modest. Advances are continually being made in uprating the film process but in addition new application for PET film in both packaging and elsewhere are continually being developed. There will be an increasing trend towards differentiation through the application of new process technologies and advances in the control of the process coupled with the combination of base polymer, filler, coating and co-extrusion technologies.